Dasha is very unique, fresh looking, clean style, bootstrap 4 compatible admin HTML template available in two versions of angular 4, HTML 5 and jquery. Its 100% ultra responsive admin HTML template built with Gulp workflow, CSS3 animations and supports quick translation as well. Featured with SASS based CSS, PUG template engine is very handy options to customize dasha admin template further without any frustrations. 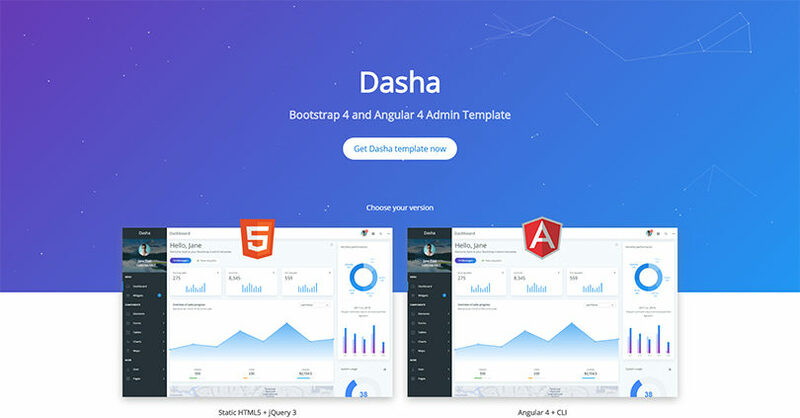 Dasha admin template has included with plenty of widgets and customized components, form elements, buttons, variety of table designs, charts, maps, custom page templates (including forum layouts) those will helps you to design all kind of admin dashboard with ease. But dasha is not backward compatible with bootstrap 3 and many features may not compatible with bootstrap 3. Apart from above specified issue, Dasha is complete and feature rich admin dashboard template filled with plenty of much needed features. Do you know we offer WordPress installation and configuring WordPress themes, WordPress plugins at free of cost? For all you have to do is buy this product using our above download link with new account and send the details via our form. Yeah, its works perfectly as you said.